Located near Deadman Summit, a few miles south of June Lake Loop along Hwy. 395, Obsidian Dome is a mile-long mound of black glass, reaching up to 300 feet high. 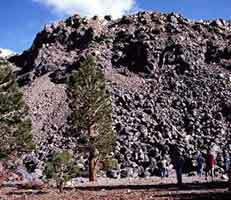 From the parking lot at Obsidian Dome, you can climb up the mound and see the different composition of the obsidian, which is not uniformly black. As you explore the area, keep in mind that the rock can be quite sharp; this is the same material used by the Paiute Indians to sculpt arrowheads, spearheads and knives, their main trade items in times past. The eruptions that formed each of these lava domes 550-600 years ago began with an explosive phase, then exuded slow-moving, sticky lava which oozed to the surface and cooled too quickly to allow crystal formation. Wilson Butte is located along Hwy. 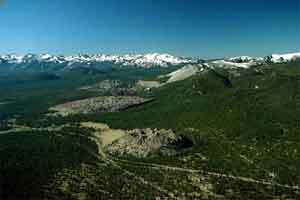 395 just north of Obsidian Dome, and Devils Punchbowl is east of Hwy. 395 just below the June Lake junction. Wilson Butte is the prominent dome as you rdive the highway. Obsidian Dome is the flatter one just beyond.